We found a helpful article over at Robot Fun on evaporative cooling. 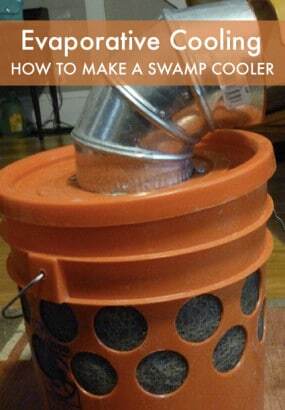 They show how to build an inexpensive swamp cooling system for under $75. In fact, they build their first two coolers for about $40 each. These swamp cooler are sized to be portable, and run on 12 volt sealed lead acid battery battery. Not only is this a thorough tutorial on how to build your own swamp cooler, Robot Fun also explains the best places to source the parts and they include price list. They do a great job, too, at explaining the options you have to build the cooler to your liking.